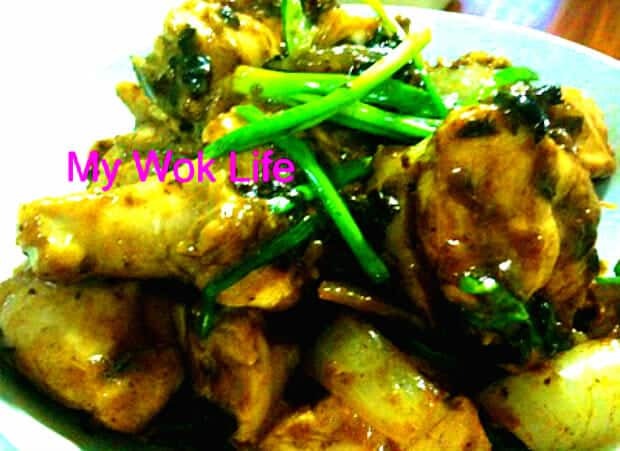 This wonderfully aromatic chicken dish is one of my favourite Cantonese dishes. We called it 豆豉鸡 (Dow Xi Gai), in Cantonese. It’s easy on preparation and big on flavour! Prepare more rice and you may end up double your usual amount this time. Remember to get the whole preserved black soy bean (豆豉), and NOT the minced soy bean paste (豆瓣酱). It usually comes bottled which already flavoured, some with oil and some with chili, off the shelves. 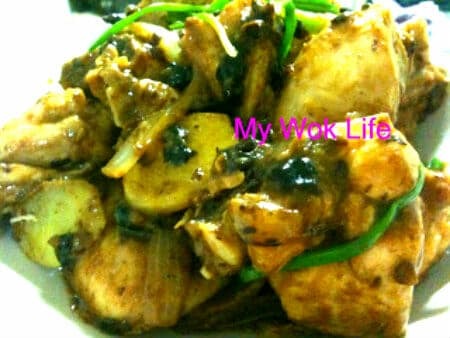 Unless the flavoured whole black bean in bottle is your only option or you actually prefer to have it spicy, cook this chicken dish with original preserved whole bean, which you may try getting it from neighbourhood Chinese provision shops or minimarts. Use of whole black bean reserves the natural black bean flavour in the dish, and you may also get to bite and taste the whole bean. 1) Marinate chicken with light soy sauce, pepper, salt, oil and corn flour for at least 2 hours (Or prepare it the night before, and marinate overnight). 2) Place black bean into a small bowl, add cooking oil and sugar. Steam for 10 minutes (use high heat if on stove). Reserve for later. 3) Heat wok with 2 tablespoons of oil over high fire. Add 2 ginger slices and sauté till fragrant. Add in marinated chicken and stir fry it for few minutes, till chicken is half done (watch out heat, reduce fire to medium, if necessary). Reduce heat to low fire, cover wok with lid for 8-10 minutes. Remove chicken from wok and drain on wire strainer with a large bowl underneath to hold the oil dripping down from the pre-cooked chicken. Retain the chicken oil for later. 4) Clean the wok, and heat with 1 teaspoon of oil over high-medium fire. Add 3 ginger slices and onion and stir fry till fragrant and onion soften. Return chicken into wok. Reduce heat to medium-low fire. Add steamed black bean, stir fry to combine well. 5) Drizzle light soy sauce and the chicken oil, and stir fry for 30 seconds. Add spring onion and stir fry to combine all well, for few seconds. Heat off and dish up. Serve with hot steamed rice. A serving of stir-fry chicken with preserve black bean counts about 250kcal. Tips: If you find it too greasy for your taste, reduce the adding of chicken oil. *If you could get only the bottled whole black bean which is already marinated with oil and sugar, use it. Skip the steaming process in Step 2, and use from the bottle directly into cooking. Can you use this sauce with tofu, vegetables and eggplant, too? I think tofu or eggplants would be good with this recipe, but I have not tried before.. However, if use tofu or eggplants, u may omit the addition of ginger, I guess. As for vegetables, not sure which vege type u are refering to..